Sometimes I read a book with the hopes that it will help me understand my children and consequently make me a better mom. In the process of analyzing my kids, I begin to analyze myself, and I make discoveries in places I was not expecting. This is exactly what happened as I read this book. And it's exactly what happened to my friends who also read it for our education principles meeting. In the first ten minutes of our discussion, we talked about strained relationships with family members, due in large part to repressing feelings and lacking emotional connections. I think we all could tell it was going to turn into a night of group therapy. The book takes an unbiased, scientific look at feelings and emotions and the appropriate way to handle and express them. In many ways, it's very idealistic: in the third chapter, he lays out the "five key steps for emotion coaching," which are "limit setting, identifying goals, thinking of possible solutions, evaluating proposed solutions based on your family's values, and helping your child choose a solution." As with most parenting books, I was a little skeptical: It sounds so simple and easy; if I do A, he'll do B. If I say C, he'll say D. In my experience, the little scripts are nice, but add in the very things this book is about (i.e., volatile human emotions), and real-life scenarios play out in very unexpected ways. However, if you can't approach emotions in a practical, idealistic way, how will you ever possibly get a grip on them? Which is why I decided to set aside my skepticism and just learn and apply all I could from this book. As I went into it with an open mind, I discovered a lot of things about my children and the ways they handle their emotions but also about myself and the way I handle my emotions. I am more empathetic to feelings of sadness than to feelings of anger. I believe sometimes you need to let yourself have a good cry, but you should never give voice to your anger. Both emotions are subordinate to happiness. Happiness is the ultimate feeling, the one we should all strive for. The more I read, the more I realized my opinions were a little (or a lot) messed up. And it wasn't just that I was believing what Dr. Gottman was telling me but that I could see the truth of it reflected in my own life. Without meaning to, my life became the perfect object lesson. I happened to read this book while I was at my family reunion a few weeks ago. It could not have been more timely. As often happens when you get a large group of people together who share common blood, there were some moments of tension. At the beginning of the week, my brother and I decided we would both try our hardest not to be the cause of any fights or hurt feelings. We even put a plate of cookies on the line to give us a little more incentive. This little competition worked like a charm for the first two days. Anytime, someone would say something I didn't agree with, I would just bite my tongue or leave the room. But as the week went on, it became more and more difficult for me to keep my mouth shut. I felt a physical pressure building inside of me, and at one point I even told Mike, "I think we might need to go home early" because I didn't know how I could possibly last another couple of days without letting some of that pressure escape, and I knew the result would be something I'd definitely regret. Anyway, all this was happening while I was reading about the benefits of not suppressing your anger but dealing with it immediately in a constructive and healthy way. On our drive home (not two days early, by the way), I realized that I hadn't handled my feelings well at all. I had felt so proud of myself for not yelling at anybody (which I still believe was a good thing), but I hadn't dealt with any of my frustration, anger, or annoyance. I kept it all inside of me until it physically hurt. In retrospect, it's totally clear what I should have done: address the problem quietly and respectfully before it got to the point that it would have exploded out of my mouth if I'd said anything. For example, when another family member bossed around my children (even when I was sitting in the same room), I could have said, "I know you're trying to be helpful, but if I'm in the room, please let me handle it." My problem is, it's hard for me to picture myself saying such a thing calmly and rationally because I generally wait to say anything until it's too late. All of this is to say that since reading this book, I'm viewing anger in a much more positive light. There are still healthy and unhealthy ways to express it. Of course there are. But if I'm feeling angry, it's because something is wrong and something needs to be addressed. I now believe that anger, if handled correctly, can be an avenue for positive change. Now that I've looked at my own emotions more realistically and openly, I've been more empathetic towards my kids' emotions. At the beginning of the book, Dr. Gottman said, ". . . we have inherited a tradition of discounting children's feelings simply because children are smaller, less rational, less experienced, and less powerful than the adults around them. Taking children's emotions seriously requires empathy, keen listening skills, and a willingness to see things from their perspective." I admit that I was definitely the mom that would send her tantrum-ing children to their rooms until they could come out with happy faces. At the very least, this book has helped me validate their feelings. I no longer try to end the unpleasant emotions as quickly as possible. Instead, I use his suggestions in the book and reflect their feelings back to them: "I can see you're feeling really upset about this. I know it can be hard not to have things go your way." But in the midst of being more empathetic, I try to set really clear boundaries: "But even when you're feeling really upset, it is not okay to hit your brother. You may take a little break in your room or outside." I've also tried to be more in tune with where the problem might be stemming from, and to be honest, it almost always comes from the same place: lack of food. When my kids are hungry, they tend to take everything very personally. A little snack goes a long way, and then, even if we're dealing with a slightly bigger problem, we can do just that: deal with it, like rational human beings. Now is this book the perfect solution? Of course not. Many of his conversations are stilted and unrealistic. Many of his personal examples are very one dimensional (probably because he only has one child who, at the time he wrote it, was still under the age of ten). And I would have really loved less script and more real life examples. However, I've read enough parenting books to know I will never find the perfect one. And that's what makes them so fabulous. I take what I want, laugh at some parts, and throw away the rest. And slowly, veeerrrry sloooowwwly, my parenting is becoming what I want it to be. How do YOU view anger, sadness, and other emotions? 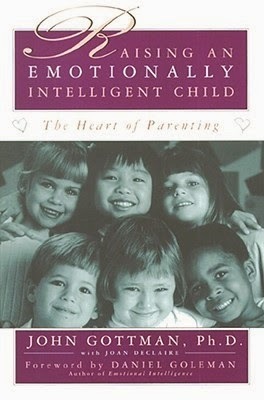 Do you have a favorite parenting book that teaches about people's feelings? Please share in the comments. Fascinating. I must look this up. Glad to hear your thoughts on this one Amy. My eldest (3.5) is a firecracker and I bought this book in hopes that I could understand her emotions a little better. You know, it never occurred to me that I would learn something about MY emotions as well. I very quickly resort to anger and often have to bite my tongue when she's pushing all of my buttons but I think it's important to be aware of how we are also pushing our children's buttons. Parenting is hard!!!! Being a child is hard!!! !